Is There a “Best” Shade of Blonde for Being Taken Seriously at Work? I have naturally dirty blonde hair, but highlight it a light golden shade. I’m a young 1L with a young face and frequently get mistaken for an undergrad and occasionally a high school student. Last time I went to get my roots touched up, my stylist turned my hair ashy blonde w/ dark lowlights at the ends. My friend said I should keep it because it was more “professional.” But golden blonde feels more “me.” Am I hurting my reputation and job prospects by keeping my hair bright blonde? Well. We haven’t done a hair-for-work question like this in a while, and I’m curious to hear what readers say. For my $.02, I think any shade of blonde hair is professional so long as you, yourself, are a professional and act like one. (I’m reminding myself of that “how to get a bikini body” joke that was circulating a year or two ago.) In general, I think that acting older is better than looking older — and as long as you aren’t twirling your hair, playing with it, and keep it well-maintained (roots and ends) there’s no problem. Of course, there’s a heavy component here to knowing your office once you start work, particularly the personalities in your office — if you suspect a senior colleague wouldn’t give you work or take you to client meetings or the like because he or she objects to your appearance, then you may want to consider changing your hair to fit in better at work. This may be perfecting an updo for work or, yes, dying your hair a different shade. I will also note that once you start work you may find that you need to factor in the time needed to maintain your hair — spending hours at the salon on a monthly basis may be prohibitive for your work/life balance. That’s my $.02, but I’m curious to hear what the readers say — do you think there is a “best” shade of blonde hair for being taken seriously at work? If you are a blonde, have you experienced any prejudice at the office because someone thought your blonde hair was not professional? What would you advice a law student about to interview regarding hair color — should she stick with a darker shade of blonde for interviews and the first few weeks of work, and then lighten her locks after she’s proven her mettle? Updated: I was sad to see that several commenters took issue with the very subject of this post, although I will point out that the actual advice given in the post aligns pretty much with what their arguments were: hair color doesn’t matter so much as being a professional does. From my perspective, I’m always honored when a 1L or other young woman writes to me with a question like this because where else is she going to go with this kind of question? I remember being invited to attend a court hearing for the first time (as a summer associate) and wondering if I had to wear a skirt suit (and hose?!? ), and being fantastically embarrassed to call the senior associate on the case to ask the question — what a lightweight I must seem! How many stupid questions was I going to waste her time on?! I desperately wanted to do the right thing — not make a faux pas or gaffe one way or another — yet I had no tools to figure out what “the right thing” was without calling the associate. That experience, and others, are part of what inspired this blog, and what drives it still. This blog IS supposed to be that safe space to ask “lightweight” questions… yes, including whether that thing your hairdresser told you about your blonde hair being unprofessional is true. Thank you to the commenters who weighed in on the issue the 1L was concerned about. Thank you! Requested a consult! PSA – it’s 2017. Can we stop with this? I’ve valued this site for many years. But — stop it with this level of looks being what you focus on ahead of interviews. Otherwise, you’re going to have a bad case of impostor syndrome for the rest of your career. It’s not your hair. FWIW, in interviews, the tried and true low ponytail can go a long way. As MM LeFleur’s tag line says — because your clothes should be the least memorable thing about you. I don’t agree with the posters above. Whether hair color is an issue and whether it should be an issue are two different things. Case in point, I’m a biglaw associate and recently went on a first date with a young biglaw partner from another firm. He told me no one would take me seriously at my firm due to being so blonde (it’s a light ash blonde). Obviously, this isn’t true and hasn’t been my experience. However, he’s in a position of power and I’m sure there are others like him. I appreciate this post on reassuring that as long as you present yourself well and do your work well, that you need to do what you are comfortable with! +1 – honestly this is the most ridiculous thing I’ve seen on here. More than the water bottle post?! Oh that is a close tie! They all just kill me – I think these overwrought “is this professional” posts are just the stupidest things ever. They make me totally ragey. Wasn’t there one about “is a cast on a limb professional?” way back when? That was awesome! I basically always find these “is this professional” posts absurd. I felt like the posts/comments were coming from people on a different planet. I assumed that other planet was the East Coast, and blamed my lack of understanding/caring on being in California. But now that I am more senior, I travel all over the country for work and particularly spend a lot of time in NY/NJ/DC. I work at a large firm and have sophisticated clients. No one cares about all these nitpicky appearance details. Dress appropriately for the situation, shower, and comb your hair. Put on makeup if you want. It’s really not that hard. Men don’t obsess over all these meaningless details, and I don’t see why we women should do it either. That’s right, dress like a man, groom your hair/yourself like a man and have no cares. Guess for someone who can afford to live in California, maybe don’t need to worry either about whether they are selected from an interview of 10 people. But then we wouldn’t constantly go out and buy new hair dye, clothes, nail polish, shoes, etc. so that we Look Professional and can be Taken Seriously! I think this all stems from the stage the questions come from, that is 2L OCI interviews and Summer associates. You are told “THIS IS INCREDIBLY IMPORTANT” and “WILL DETERMINE THE REST OF YOUR LIFE”! Ack! High Value! And you, as a little baby 2L feel a lot of “imposter syndrome”. And, you feel like it is all really arbitrary and based on who knows what, like just how the interviewer feels about you? And of course people say stuff like “it looks more professional” and you read studies that women who wear some makeup are viewed as more intelligent, and perhaps you have actually even really experienced some of these sexist standards in your sorority or job hunt or whatever. So, you grasp on to the few bits of information you know and that you can control. At this point, you can’t improve last years grades or the college you went to. But you don’t want something “dumb” like your hair color or nylons or heel height or water bottle or nail polish to RUIN YOUR LIFE! So you freak out about those things. Keep your hair whatever color you want forever, but especially don’t worry about it until OCI. Honestly, for OCI I’d do the more mature blonde since you get mistaken for a high schooler, but that’s several hair colorings from now. I agree with Wildkitten. Personally, I think that my haircolor has been an asset b/c men seem to be more interested in me then women who are prettier then I am and I think it is b/c of my strawberry blond hair. My freind Laurie is SO much more beautiful then me but she is a BRUNETTE, and men simply never were as attracted to her in Law School then me. Even the PROFESORS nearly always nuzzeled up to me, NOT Laurie, and we think it was because of the mistique that being a Strawberry Blond carries with it. I think that the manageing partner also hired me in part b/c of my look’s and the judge also like’s me b/c of my appearances in court with nice clotheing. So these dumb things can and DO make a difference after all. YAY for me! Yeah, golden blonde is fine. So is platinum blonde. Giggling and flipping it around is what causes problems, not the color. +1 I’m naturally blonde and go so light it could be considered platinum. I also have longer hair, it’s past my collar bone. Not once has my hair been brought up by my managers, bosses, clients or co-workers, even when I went lighter. I’ve met more brunettes that are “typical blondes” than blondes. It’s in your behavior, not your hair color. I agree with anon-however sometimes rising up in a work place means fitting in with the norms, rather than spending time and effort to fight them. As Cat said- I think any hair can look right on the right person. If your hair is naturally light, then you probably look great with naturally light hair. I do think overly tan/too blonde/too long of hair does make me think that someone has different sense of what looks good than I do (think KAC– although clearly she is good at what she does and has risen to the top, despite a look I think of as slightly less professional). In my own case- when I was in law school, I kept a short bob & straightened my hair. I felt like this made me look more polished and pulled together for interviews- I also wore light makeup and unobjectionable clothes & jewelry for interviews, and at the start of my job. Now that I am 10 years into my career and work in a construction company as counsel, I have long (naturally) curly/frizzy hair, usually in a bun, I wear jeans daily, wear funky jewelry when I want to and rarely wear makeup. Honestly, I have a hard time imagining this is a real issue. If you like sunny blonde hair and you can pull it off, awesome. Get your hair colored and then go to work, work hard and follow the instructions and advice given to you by your managers and those senior to you. Unless your employer is a lunatic, they will not care that your hair is a brighter blonde or an ashier blonde if you are doing a good job and if you are a pleasant person to be around and to work with. I do second Kay’s advice re maintenance. I totally agree that being a blonde isn’t an issue, but that having a hair color that clearly looks “fake” can make someone look less professional. The number one tip-off to fake blonde hair is dark roots, but I think if you’re willing to put in the time and money to keep your color looking nice and the shade you pick looks natural with your skin tone, any shade of blonde (or brunette, or red) is just fine. I think brunettes can be offenders on this front too, like someone who dyes their hair several shades darker but doesn’t also darken/fill in their eyebrows so they at least sort-of match. How do you react to a random college acquaintance with whom you have no positive working experiences asks for a referral? FWIW, I am 6 years out of undergrad. The Acquaintance in question was a year behind me at college and extremely unprofessional back when we attempted to work on committees together. Can you pull a “I don’t feel like I know enough your work performance, but good luck to you” or something like that? Or, just dodge the request entirely if you have no other options? Do it as soon as possible so she has time to find someone new. Hopefully she’ll get the hint. IF she insists (which I had someone do once) or if there isn’t enough time for her to find someone new, then just keep it vague if/when you talk to the person they sent your name to. Is she asking you to be a reference or is she asking you to pass her resume on? What do you mean by referral? Can you pass it along without commenting on the person? Like – I don’t know this person well, but here is a resume? Or is this a situation in which he would reflect on you even if you just pass on the resume? The latter :( And unfortunately, this seems to happen more and more often (about 10-12 times a quarter) because a lot of people my age are going to and getting out of graduate school/changing industries etc. Please don’t pretend to pass it along – that doesn’t just seem devious, it actually IS devious, and just a jerky thing to do. If you don’t want to share it, then don’t share it, but don’t make the situation worse for the guy. I don’t even know what the difference between golden blonde and ashy blonde is. There’s a huge difference between having a young face and being mistaken for a high school student based solely on appearance, and being mistaken for one based on how you behave. Reader A, if your problem is that people card you at the movie theater based solely on your face, and having nothing to do with your behavior, I would stop worrying about how young you look. If it’s that people are assuming you’re 17 after getting to know you in a professional setting for a few hours, I would start to worry. 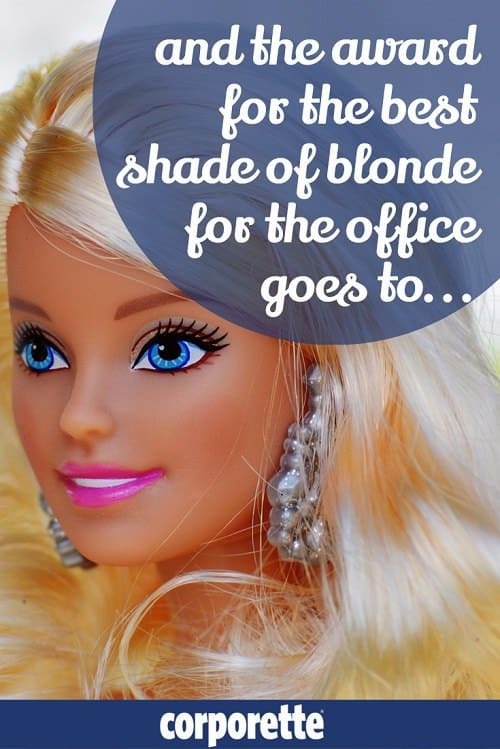 Funny timing– I just started thinking about this last week when I was at a conference and looking out into the crowd I noticed there wasn’t a single blonde professional– the only blondes in the room were at the law students’ table. It’s true I only know a very few sorority- blonde lawyers but that’s probably a combination of lawyers don’t have the time to stay super blonde, and being sorority-blonde is a younger look. Also those of us with naturally blonde hair get darker as we get older. 5 years ago my hair was significantly lighter than it is now, and I have never dyed it (other than the blue streak when I was 15). Some of those “sorority-blonde” women may have had naturally blonde hair that got darker. This is me. I grew up with natural sorority blonde hair and now I have more golden/dirty blonde hair. My stylist recently recommended I go blonder but I’m not sure I want to do it since I’ve never dyed my hair. It really just looks like I let me roots grow out now though so I should probably consider it. I have natural ombre courtesy of age. Either is fine, unless the entire set of choices you are making about how you choose to present yourself puts you into Legally Blonde territory. And where that line is varies by region. Don’t worry about your hair color, think more about your actions (i.e. no twirling it or flipping your hair), generally keep low maintenance hair (such that you are not always pulling it out of your face to read) and style it appropriately for work (this is more for younger attorneys, as the more experienced you are, the more you can get away with style). If you can recognize that hair style for a nightclub is different than hair for the gym is different than hair for the office, you should be fine. I know a female lawyer who is naturally brunette, and then died her hair very pale blonde. She looked great both ways, and professional both ways. I had first met her in a professional group – all women. From the first she seemed knowledgeable, articulate and reliable. After a few years, she came to the group as a blonde. During a break, I asked her if she had noticed any difference in the way new clients/colleagues treated her. She said that if she had talked to the person previously on the phone, there was little if any difference in treatment when the person first met her in person. But if her first exposure to the person was as a blonde, it seemed to her that it would take longer for her to establish her credibility. This was more than ten years ago, so I can’t recall if ‘longer’ was a few hours, or a few interactions. Well, only somewhat on topic, but I decided to take the plunge. Rainbow hair is happening in two weeks. And I just got my contract extended! Ahhhh, so jealous!! I am getting bolder and bolder with my red/blonde ombre (that looks like fire according to one of our customer service reps). Is there a more professional skin color than another? That’s about how offensive this is. Pro tip: orange skin is never professional. I agree with other people. It is not so much the color as the style. You should wear the best hair color for your complexion and just make sure it is styled to look neat and professional. Honestly, what makes young attorneys look juvenile in my opinion is the really long pin straight hair I see. I swear every young woman in law school has this hair. If you want to look more mature, keep it shoulder length or a little below. I don’t dye my hair, because why should I? But posts like this are why people find it still okay to make blonde jokes to my face and tell me when I mess up that I am just having a blonde moment. Not cool. The most professional blonde is Daenerys Targaryen blonde. Get out my way, I got Mother of Dragons things to do! I understand how people could not see this as a serious question, but when you’re young and beginning your career, everything matters. Perception usually trumps ability when you’re new and people don’t know you. I’m 33 and barely look old enough to be a college student. I was in a department for over 10 years and the VP once asked me if I was old enough to drink yet. He was 100% serious, even though it was completely illogical. I feel like this blog is a safe place to discuss all kinds of topics because we’re all trying to be better. Why make someone feel bad for asking a question that fits with the other topics that have been discussed before? If you don’t want to give helpful advice, then don’t comment. Just move on. To the people saying this is ridiculous: I’ve been criticized for my hair being “too blonde” in a professional setting when I was in my early 20s. This is a fashion blog, shallow concerns are going to be discussed. Good Morning, as an blonde attorney working predominately in finance and bankruptcy, I find the soon-to-be attorney’s question relevant more than she knows. I am very dismayed by all commentators on this post who would categorize her as a lightweight for asking it. This is an excellent demonstration of why women are their own worst enemies in the workplace. To directly answer your question, I recently have upon the advice of my stylist adopted a ballyage technique which is subtle and brings in my natural color more while keeping strong highlights. This allows for natural outgrowth without that harsh line across your scalp that heavy highlighting creates and softens your overall appearance. Look at the salon’s photos they use to advertise themselves. Make sure the technique is not too chunky or dramatic. I have found over the course of my career that looking “expensive” when dealing with certain clients and opposing attorneys is best. This does not mean you bankrupt yourself with labels, but make sure you are put together in a way that says I can handle your money and your interests. If you are a blonde I would also recommend transitioning to a brown shadow or liner instead of black. This helps with the contrast. I hope this helps. I agree with L. I actually recently came upon an article in which a study found that statistically, female CEO’s are disproportionately blonde (and yes, there was a mention in the article about how race may play a factor in this). I thought the research was very interesting, and the point is: this is something that’s being researched. Whether we think it’s right or not, society and our bosses judge us by how we look in addition to our competence and how we behave. We can shake our fists and refuse to participate in the discussion and malign those who dare to acknowledge that it’s happening, or we can try to unpack it and perhaps try to get ahead despite these things. I am a blonde attorney with naturally dirty-blonde hair. During my 1L year, I also went darker and didn’t feel like myself. During my legal career I’ve had long blonde hair nearing platinum and now I have a very short golden-blonde bob. I have never felt that I was treated differently due to my hair color. What matters more than color is whether or not you are pulled together and polished. (The judge I worked for my 1L summer said I stood out from all of the other externs because of my “polish.”) I prefer my golden blonde bob because it is easy, requires less maintenance, and always looks professional without much effort. In law, we are paid large sums hourly and our clients pay for professionalism. That’s all that matters. If someone doesn’t take you seriously because you’re blonde, THEY are the problem, not you. Be yourself and be confident. Most importantly, work with people that value YOU and allow you to be yourself. Thank you to Kat and everyone who answered my question. Yes, it was silly and I felt self conscious asking it. I was frustrated at the idea that something as trivial as my hair color could be an issue, as it wouldn’t have occurred to me to worry about it until my friend said something. But I come from a community in which women rarely pursue careers. Almost everything about legal culture feels unfamiliar, and I’m always learning new unwritten rules about how to make my way through it. Some of them don’t seem any more serious than hair color from my perspective. So thank you, Kat, for providing a space where women like me can ask about the things we wish we didn’t worry about. I’ve been practicing 9 years – funny, I do actually think there has been some shift during this period in what women lawyers are expected to look like. Not universally, not at the ideal level (i.e., this should be a complete non-issue), but I feel movement in the right direction. Also STRONGLY echo many comments that confidence, work product and your professionalism are most important. I went platinum – like white blonde- a couple of years ago & have long hair past my shoulders. Was always blonde, but went all the way. People LOVE it. I work with all kinds of clients & elected officials. People tell me I stand out & look old Hollywood. I happen to rock a lot of black clothes & classic pieces too, and I love this look. I feel more like myself than ever & I think that’s what shows – people can see my personality. I recently had my short, naturally blonde hair highlighted and then colored turquoise. I have never felt or looked more wonderful! I love love love my look and as the color matches my eyes, it is actually feel natural. I get nothing other than compliments on it. (well, other than DH who misses my blond, but he loves that I’m happy!) I’m a 50 year old IT project manager consulting to a Fortune 500 and it’s just dandy. Sometimes it helps to: (1) get out of New York/Boston/DC and (2) get older and get the F-Its.